Chambers are organizations that represent businesses in the community. The advocate for business-friendly policies and help businesses train the next generation of employees. The Greater Phoenix Chamber is now over 130 years old and has been pro-business before the state of Arizona was even formed. With their new “Find Your PHX” initiative, the future looks bright. I sat down with Jennifer Mellor, Chief Innovation Officer, to better understand the role of the Greater Phoenix Chamber. I came away impressed with how much they’ve accomplished. And I love where they are headed in the future. 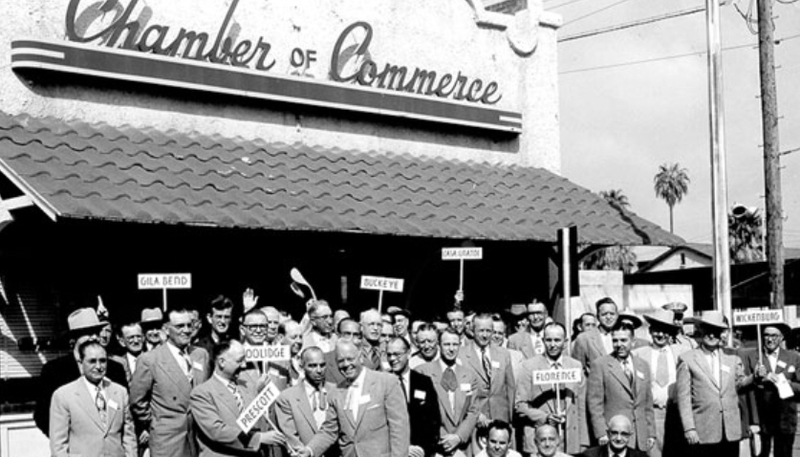 The Greater Phoenix Chamber was formed in November 1888 by leading business owners in the Valley of the Sun. They were originally focused on attracting more settlers to the local area and building infrastructure to support the citizens. This included building a railroad to the forests of the north, better roads to foster commerce, and accommodations for travelers. As Phoenix and Arizona continued to grow, the Chamber helped to promote the area as an affordable an attractive place to live and vacation. Today, there are over 4 million residents in the greater Phoenix area. The Chamber has more than 2,400 members contributing to the local economy. There is a mix of businesses within the Chamber. All of the Fortune 500 companies that do business in Phoenix are members. Small businesses comprise 80 percent of the membership and are a big driver in job growth. By becoming a member of the Chamber, these businesses continue to expand, employ more local citizens, and grow the Phoenix economy. What are the Benefits of Joining a Chamber? The Chamber pools resources from local businesses to promote pro-business regulations at the state and local levels. Regular networking events where you can meet fellow members and discuss opportunities to collaborate. Professional development events with top executives sharing best practices that you can implement in your own business. Benefits and discounts with local businesses that can save your business time and money. For benefits specific to your local Chamber, contact their membership coordinator to discuss how joining can benefit your business. What Initiatives Are They Working On? The Greater Phoenix Chamber is always working on new initiatives to help their member businesses and the local community. Here are a few of the latest initiatives that are underway. There are over 100 construction businesses that are members of the Greater Phoenix Chamber. The Chamber is implementing a massive career awareness campaign for the construction trades to help drive talent to this industry. The effort is targeting adults who are looking for a career change and to the next generation who are deciding which careers to pursue. It is widely known in the medical community that the nation is facing a nursing shortage. The Chamber is coordinating efforts with the medical community on joint recruitment strategies to address the need for more nurses and medical staff. Banking and financial services is a growing industry. The Chamber has partnered with financial services firms to provide training through a 3rd-party provider. The goal is to attract a new pool of talent who wouldn’t traditionally pursue a career in this sector. The Chamber is researching educational alignment initiatives to ensure that education providers are tailoring their curriculum to meet employer needs. Additionally, they are working on opportunities to increase the number of workplace experiences offered by Chamber members through internships, apprenticeships, and boot camps. Affordable healthcare is front and center on the minds of businesses and employees. The Greater Phoenix Chamber is partnering with member businesses to implement robust wellness programs to lower healthcare costs. The Chamber is creating a turnkey resource that members can offer to their employees. Healthy employees are happier and more productive. What is Find Your PHX? And businesses continue to relocate to Phoenix and grow, they attract more senior level executives to contribute their success. The Greater Phoenix Chamber wants to ease the transition as they join the community. This is where Find Your Phoenix comes in. Find Your PHX acts as a concierge service to help these executive-level colleagues research the local community for housing, education, and personal needs. During the executive’s initial visit, Find Your PHX will showcase the benefits of the local area and answer their questions. And once they move to the local area, Find Your PHX helps them assimilate into the local community. Follow this link if you’d like to find out more about the Greater Phoenix Chamber or the benefits of opening a business in Phoenix.